Quadros Systems, Inc. | CEVA - Quadros Systems, Inc.
Find out more about how Quadros Systems software and services can assist you with your next CEVA-based platform. Headquartered in Mountain View, CA, CEVA is the world’s leading licensor of programmable Digital Signal Processor (DSP) cores for mobile handset, consumer electronics and storage applications. Quadros supports the CEVA-X family of synthesizable programmable DSP cores, each delivering a different balance of performance, power dissipation and cost. Because the cores are largely software compatible, it is easy to move application code from one to another, significantly reducing investment in code development, tools and designer training. The CEVA-X family of cores is based on CEVA’s latest pioneering DSP architecture. This architecture offers best-in-class performance, scalability, and lowest cost-of-development for DSP deployment. The CEVA-X1622 is a high-performance, low-power DSP. Features include enhanced memory architecture, configurable memory size, and configurable memory bank organizations. The flexible memory architecture allows you to make an optimal cost /performance selection. 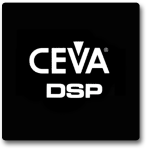 The CEVA-x1641 is a high performance processor for more-demanding DSP applications. It offers a unique mix of Very Long Instruction Word (VLIW) and Single Instruction Multiple Data (SIMD) architectures. The CEVA-X1643 is a highly-energy efficient, 1 GHz DSP core designed to boost overall chip performance for a broad range of applications including wireline and wireless communications, surveillance, portable multimedia and more. It supports easy migration from off-the-shelf DSP devices to DSP cores incorporated into SoC designs, and a seamless migration path for TI C6x based designs. Quadros Systems is working with customers who plan to use the XC series. Talk with your sales representative to find out about availability. RTXC RTOS is delivered in source code with a working project and sample code.